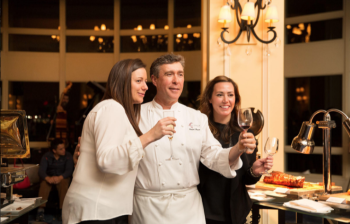 The Boston Win e Festival, founded by Chef Daniel Bruce in 1989 is held annually at the Boston Harbor Hotel, is one of the nation&apos;s longest-running wine and food pairing series. Spanning three and a half months and including multiple events each week. Through the festival&apos;s 20 plus year history more than 75,000 bottles of wine have been opened and Chef Bruce has never repeated a menu, totaling 3,000 different dishes at 750 dinners served. Each year, the highlighted events of the Boston Wine Festival include the Grand Opening Reception - an opportunity to sample more than 50 wines and enjoy a magnificent buffet prepared by Chef Bruce. Another event not to be missed is the Valentine&apos;s Champagne Dinner Dance - grab your partner and enjoy a romantic evening of live music and dancing, coupled with incredible wine and food. Boston Harbor Hotel offers overnight packages throughout the festival - After an evening of wining and dining, take advantage of the luxury accommodations available at the hotel. These are just a few of the events that are held during the festival. For more information please visit Boston Wine Festival&apos;s Event page.